You are a recent DPT grad and now you want to start your physical therapy career headed in the right direction. 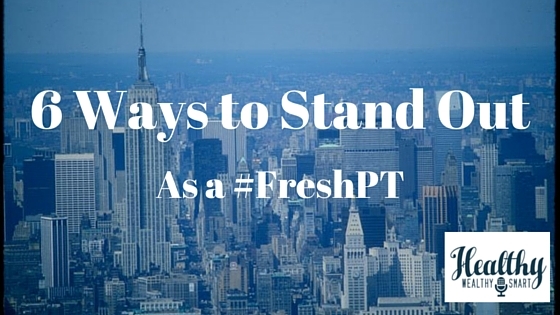 How do you stand out a #FreshPT in the workplace, in your community or in the world of physical therapy? Here are 6 easy ways you can stand out in the crowd! When you are working with your clients the person that matters most is the one sitting in front of you. It is all about that person and not about you. You must think: How can I stand out for this person? What can I do that will have a positive impact on their life? One of the easiest ways you can do is by listening to their entire story and ask thoughtful and open ended questions, especially during your initial interview but also during your follow up visits. Often times a when a person comes to you they have been through the medical system and feel like they have yet to have their story heard. I cannot stress enough how important it is for you to be that person that listens! You are more likely to forge a strong therapeutic relationship and instill trust in your patient. Not only will you stand out in the eyes of your patient but you will also stand out in the eyes of your peers and superiors because your patients will be excited to see you and will be more likely to go all in on your plan of care. 2. Develop your clinical skills. When interviewing for a position be sure to ask your employer if they subsidize continuing education and how much they provide per year. Then be proactive about attending continuing education seminars. My advice is to take inventory of your skills and education and make a list of the areas you feel you need improvement. Then start looking for the courses that would be a good fit for you and your skills. If you are really interested in a specific speaker, reach out to him/her and ask how they typically run their courses. Some speakers may offer a few free seats to the hosting clinic along with a revenue share with that clinic. This way you get to attend the course you really want (for free) and the clinic you work at gets some extra money. The clinic owner or director will be impressed with your initiative and will certainly take note. There are so many online options for you to choose from. From courses through the APTA to independent education companies you have many options to choose from. This is a great way to get the education you need with less expense and greater ease. You don’t even need to get out of your PJs to learn. Also, look for courses that are live-streaming their events. For example the San Diego Pain Summit live-streams the entire summit and you can even ask questions remotely. *Blogs, list serves, and social media. Follow sites/people that fill in the gaps you identified in your inventory check. Don’t only follow sites/people that think the same way as you or who are interested in the same topics as you. You must think out of your box and follow sites/people that challenge you and your ways of thinking. This is how you will grow and mature as a competent well rounded therapist. 3. Consider a residency or fellowship. Again there are lots of options to choose from here. You will want to go back to your inventory list and see what interests you and where you feel you need improvement. Then seek out a site that fits your criteria. You can check out the American Board of Physical Therapy Residency and Fellowship Education page for a complete list! Like the English poet John Donne wrote in Devotions Upon Emergent Occasions: “No man is an island”, no one physical therapist can be everything to every patient and everything to themselves. This is why finding a mentor is so important. Having someone to bounce ideas off, learn from, and collaborate with is priceless. *How do you find a mentor? That person might be working with you in your clinic/hospital, someone you “met” online on social media or blogs, or a more formal mentorship program. Erica Meloe, PT, MBA and I are working on a formal mentorship opportunity (PhysioTherapy IQ or PTIQ where we are combining clinical excellence with business strategies) that we hope will be finalized in a few months. We are Beta testing now with a small group of #DPTStudents and #FreshPTs…more info coming soon! The important thing to remember about mentors is you really have to be the one to seek them out. People don’t know what they don’t know…and if they don’t know you need them you could be missing out on a great opportunity. So if you want to stand out as a #FreshPT be proactive and find a mentor! Volunteering is a great way to network with people in your community while doing good! You can volunteer on your own or organize a group from your place of work. If you are already a clinic owner, volunteer your services at local events. This will help with visibility in your community and might give you some good ideas on programs to add to your clinic. If you need volunteer ideas check out Global PT Day of Service here. And don’t forget the PT Day of Service this year is Saturday October 15th! So there you have it! 6 easy ways to stand out as a #FreshPT. Now is the time to take action! Start your gratitude journal! Nothing fancy…go out and buy notebook or start a virtual journal and write down your 3 reasons for being grateful today! Google non-profits in your area and see how you can offer your services. I volunteer at an animal shelter here in NYC and I love it! Create your clinical skills inventory list. Write out the skills you are confident in in one column and then in the other column write out the skills you feel need work or you did not get enough of in school. This will help you get clear on the continuing education courses you should seek out and also the type of mentor you need. I am sure there are many other ideas to add to this list. Feel free to leave a comment below or tweet me @karenlitzyNYC and let me what you have done to stand out as a #FreshPT!